She will not face a Republican opponent in November's mid-term election. It is the latest in a series of victories for progressive, young and minority candidates representing the Democrats. This year has also seen a historic amount of female candidates run for Democratic nominations. In a speech after her win, Ms Pressley said: "Change is coming and the future belongs to all of us." 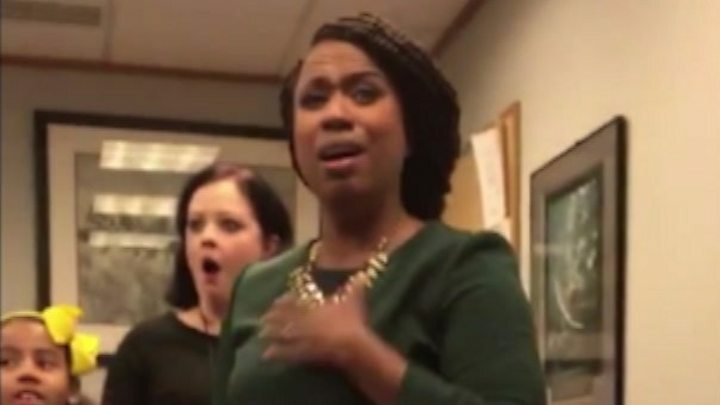 She also referred to President Donald Trump as "a racist, misogynist, truly empathy bankrupt man" and hit out at wealth inequality in her seventh congressional district. It is the only district in her state to have a majority non-white population. Can we tell now if Democrats will win? Conceding on Tuesday, Mr Capuano said: "Clearly the district wanted a lot of change. But so be it, that's the way life goes." Both he and Ms Pressley are seen as progressives - but she advocated for a more "activist" style of leadership. 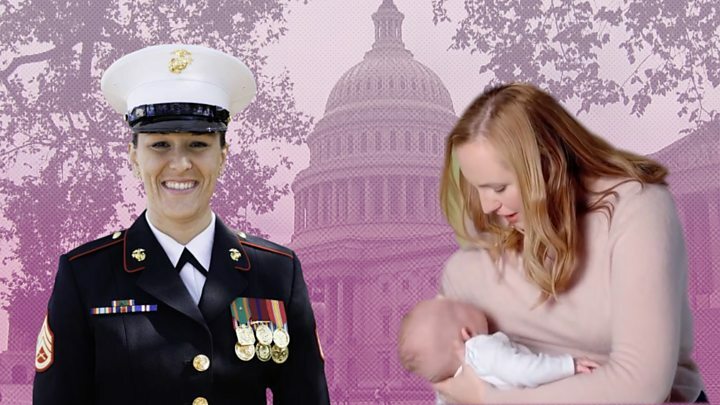 Before becoming a councillor she worked for Senator John Kerry and Rep. Joseph Kennedy II - whose uncle, John F Kennedy held the seat Ms Pressley is set to win before he became president. Ms Pressley's victory comes two months after a similar win against a 10-term opponent by 28-year-old Alexandria Ocasio-Cortez in New York. Political analysts predict all nine of the state's House seats will remain Democratic in the November vote. 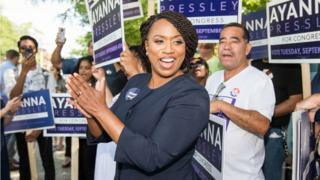 The Boston neighbourhoods that once helped send former President John F Kennedy and speaker of the House Tip O'Neill to Congress will soon be represented by Ayanna Pressley. Her upset victory on Tuesday reflects the changing face of the Democratic Party - younger, more progressive and more diverse. That should both excite and scare Democratic leaders. There is boundless enthusiasm in their base, which can translate into electoral victories, but they may not be the politicians who take their party to the promised land. Michael Capuano wasn't caught flat-footed in this race, either. He is well liked in his district and spent time and money to keep engaged and connected to his voters. They just wanted someone else. So far, this anti-establishment sentiment in the Democratic Party hasn't cost their side seats, unlike the grass-roots Tea Party insurgency among Republicans during the Obama years. The Democratic incumbents who have been upended have been in safe districts. This is a warning to the party, however, that they shouldn't be complacent. If their side makes big gains in the mid-terms, the base will expect results - or the intra-party combat may just be beginning. Massachusetts senator Elizabeth Warren, a favourite to run in the 2020 Presidential election, was uncontested for the state's Democratic nomination. According to the non-partisan election tracking website, Ballotpedia, there are three elections for the US House of Representatives where Democrats have chosen to not field a candidate. There are 39 races for the House in which no Republicans are standing.